The Prema Powerteam's driver set the pace in both qualifying reducing his classification gap from Riccardo Agostini as the latter did not manage to place the JD Motorsport's Mygale higher than the fifth and sixth place. The front row of race one will be completed by Maisano, while Giovesi will start race 2 on the side of Cheever. 19/10/2012 - The season of the Italian Formula 3 European Series and the Italian Formula 3 Championship is going to end the way it started. In the first race of the European series in Valencia and in the first race of the Italian championship at Mugello, Eddie Cheever set the pace twice in qualifying. Similarly, today in Monza the Prema Powerteam driver from Rome placed twice his Dallara ahead of everyone else securing two precious points ahead of the three last races of the season. 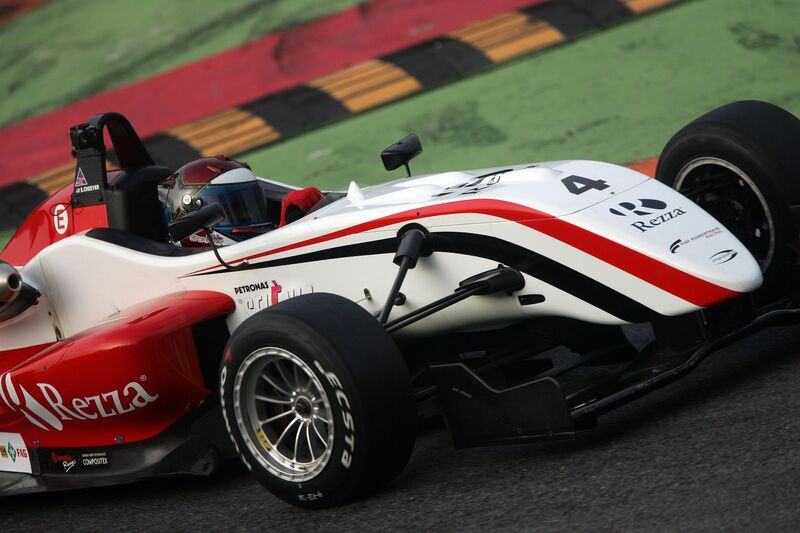 This increases the count to 8 pole positions in this 2012 season of Formula 3, half of the available ones. Only two other drivers got more than one pole position in this season and they are the other two title contenders Riccardo Agostini, 6 times poleman and Brandon Maisano, who obtained the two pole positions in Misano. Cheever in qualifying one was faster than his team mate Brandon Maisaon, as the Ferrari Driver Academy pupil was relegated to 7 tenths to the pole. The second row of the first race of the weekend will be composed by the very good Mario Marasca, on the Dallara of team BVM and by Kevin Giovesi, in force at team Ghinzani, with the latter at a second from the leader Cheever. The fifth time was set by Riccardo Agostini, who struggled a bit in the Mygale of JD Motorsport and ended his best lap only two hundredths from Giovesi but could not get the second row anyway. On the side of the driver from Padova, will be the third Prema Powerteam's driver, Henrique Martins who was 4 tenths faster than Nicholas Latifi (JD Motorsport). The fourth row will be completed by Robert Visoiu, the Romanian driving for team Ghinzani who had a performance drop in the second half of the season. The last row of the grid will be occupied by the two Euronova's drivers Yoshitaka Kuroda and Sergey Sirotkin, who accused a little technical inconvenience that was quickly fixed by the men led by Vincenzo Sospiri. Eddie Cheever also was the fastest in the second qualifying session at Monza. The Italian stopped watches in 1’45’’555, which was only 65 thousands faster than the Milanese of team Ghinzani Kevin Giovesi, who was stripped by the joy of the first pole of the season during the last lap. The second row will be occupied by Brandon Maisano and Mario Marasca, as the two confirmed the good performance shown in the first session. The third row will be inverted as compared to race one's: Henrique Martins will lead JD Motorsport's Riccardo Agostini. The fourth row was obtained by the two Eastern Europeans: the Moscow driver Sergey Sirotkin (Euronova) and the Romanian Robert Visoiu (Ghinzani). The grid of the longest race of the weekend will be closed by Nicholas Latifi and Yoshitaka Kuroda. The first race of the weekend will start tomorrow at 14.15 (GMT+2) and will have live coverage on Rai Sport 2 and web streaming on www.acisportitalia.it/F3. On Sunday, the last two races of the season (again live on Rai Sport 2 and web coverage): the longest will be run on 30' plus a lap starting from 09.00, while green lights on the sprint race will go off at 16.10.